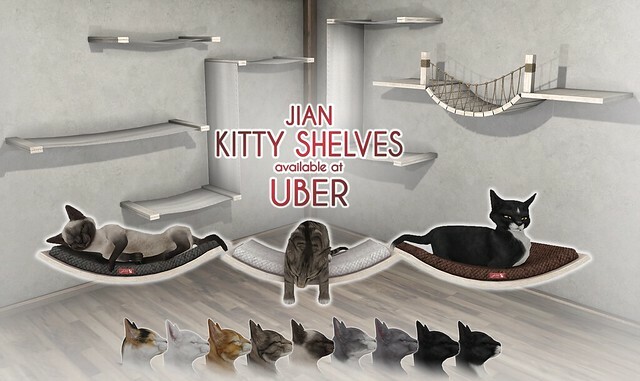 JIAN: Kitty Shelves @ UBER! Get 'em now @ UBER! Kitties need considerable storage space in your home to be comfortable. Give your kitties the proper amount of comfort and versatility with Jian's new kitty shelving! It's easier to assemble than IKEA, we swear. This product comes with a number of static decorative shelves for any and all kitties (or pets really) and 3 animated kitties on cushioned shelves. The animated kitties also boast 9 fur textures and 4 cushion colors.